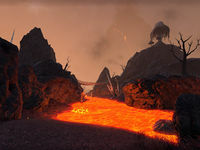 Molag Amur is the volcanic region on the southeastern side of Vvardenfell's Red Mountain. The region extends from Molag Mar on the edge of Azura's Coast in the south, to the ancient Dunmer stronghold of Falensarano on the edge of the Grazelands in the north, and from the Dwemer ruin of Arkngthand in the west to the Daedric ruin of Tusenend in the east. The Dwemer ruin of Nchuleftingth and the Erabenimsun Ashlander Camp can be found in the center of the region. This page was last modified on 19 March 2018, at 05:15.